So Days Off are Merely a Carrot and I'm a Donkey? I was supposed to switch days off with my Manager this week which would give me today off and I would work for him tomorrow while he has several doctor appointments. But he's sick. I'm feeling more human, although still sick too, so I'll work today for him and tomorrow for him. Thinking that maybe with a lot of luck I'll have Thursday off because I have an art project due Friday and just barely enough time to achieve it. Maybe. If the stars are in alignment. And if I make appropriate sacrifices. So my days off are turning into an illusionary carrot today. Tonight we meet with our accountant. I will be spending my early morning at the shop getting my bank statements, etc into chronological order because that's what I do - LOL. An extra hour or two with room to spread out would be helpful, but I'll make it work, I have no choice. And today is the Equinox, Ostara, the earlier arrival since 1896. Wow! Obviously I wasn't thinking (actually I was, but not thinking well) setting up my tax appointment on Ostara, but I'll just throw my fate into the hands of the Powers and allow them to show me a new life ahead through the actions of my tax guy. *sigh* Doesn't sound very positive or romantic, does it? Good Ostara to all of you. Thank you, my dear. May your coming year be filled with joy. 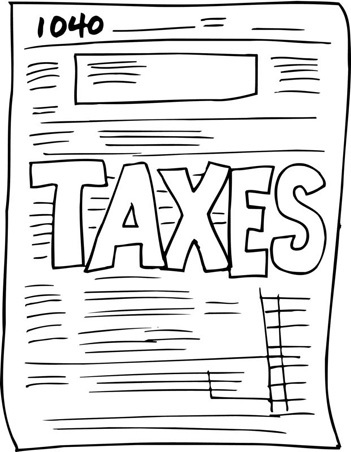 tax time coupled with being sick, bah humbug. Still, it can be counteracted the celebration of the equinox. I said in my gardens today to celebrate. The forsythia is blooming, the brilliant yellow and the Magnolia tree is blossoming in pink. We got daffodils, Myrtle, crocuses, hyacinths and the roses have green on them. Even my bleeding heart is starting to push its way out of the soil. Everything else may be upside down, but I'm glad that spring is here. Oh my, just imagining that many things growing amazes me. I noticed yesterday that a few of the weeping willows have the very beginnings of green on them, that lightest coloring of green that just the tip of nature's paintbrush brings out. And we just got the first green grass, today driving to the post office, it was quite evident and so wonderful to see green instead of our brown. But we have a long way to go before we get your flowers. 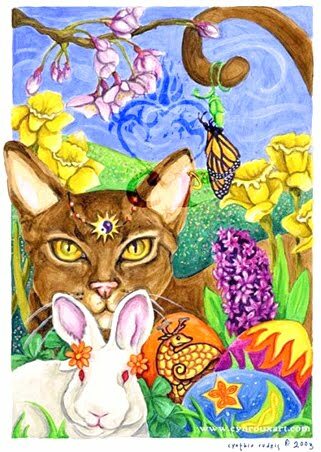 Blessed Ostara to you, my dear friend! May the Powers smile upon you and yours.